Patient satisfaction is becoming highly recognized as a crucial factor in healthcare design. Innovation in this field is often accomplished through design challenges, which use crowdsourcing to find a creative solution to a problem. In 2009, the DiabetesMine launched the DiabetesMine™ Design Challenge to develop tools to improve the lives of diabetes patients. MultiMension worked with Jaewoo Joo and Chihiro Hoseo to design an interface that motivated patients to check and control their conditions. The design process was very interesting. Collaboration with Jaewoo and Chihiro led to many engaging and dynamic discussions. Jaewoo’s logical thinking and Chihiro’s generation and evaluation of ideas were both impressive. After various sessions, we decided to create a tool that allowed patients not only to manage their diabetes through tracking conditions but also to learn about their condition and its management. 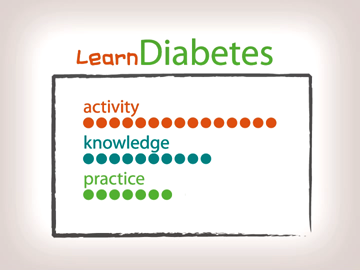 The final product was an interface called Learn Diabetes that consisted of an activity section (during which the user submits information on their conditions), a knowledge section (which consists of engaging quizzes), and a practice section (which allows the user to apply the information they have learned). Read Jaewoo’s entry about the process.